The Sikorsky S-70 is an American medium transport/utility helicopter family manufactured by Sikorsky Aircraft. It was developed for the U.S. Army in the 1970s, winning a competition to be designated the UH-60 Black Hawk and spawning a large family in U.S. military service. New and improved versions of the UH-60 have been developed since. Civilian versions, and some military versions are produced under various S-70 model designations. The S-70 family was developed to meet a US Army requirement to replace the UH-1 Iroquois family of utility medium-lift helicopters in 1972. Three YUH-60A prototypes were constructed, with the first flying in October 1974. They were evaluated against the Boeing-Vertol YUH-61A. The YUH-60A was selected for production, and entered service as the UH-60A Black Hawk with the US Army in 1979. After entering service, the helicopter was modified for new missions and roles, including mine laying and medical evacuation. An EH-60 variant was developed to conduct electronic warfare and special operations aviation developed the MH-60 variant to support its missions. In the late 1980s the model was upgraded to the UH-60L, which featured more power and lift with the upgrade to the -701C model of the GE T700 engine. The improved UH-60M model was developed in the early 2000s. The UH-60M and its International version, the S-70i, include GPS navigation, a glass cockpit, an integrated Flight Management System, and a significant upgrade to the powertrain and rotor system adding both power and lift capability. 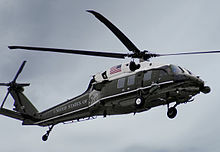 The S-70 can perform a wide array of missions, including air cavalry, electronic warfare, and aeromedical evacuation: several versions are used to transport the President of the United States, which while carrying the President is known as “Marine One”. In air assault operations it can move a squad of 11 combat troops and equipment or carry the 105 mm M102 howitzer, thirty rounds of ammunition, and a six-man crew. Alternatively, it can carry 2,600 lb (1,200 kg) of cargo or sling load 9,000 lb (4,100 kg) of cargo. The S-70 is equipped with advanced avionics and electronics, such as the Global Positioning System. The United States Navy received the first navalized SH-60B Seahawk in 1983, and the SH-60F Ocean Hawk in 1988. The HH-60G Pave Hawk is a highly modified version of the S-70 primarily designed to recover downed aircrew or other isolated personnel during war and equipped with a rescue hoist with a 250 ft (76 m) cable that has a 600 lb (270 kg) lift capability, and a retractable in-flight refueling probe. The United States Air Force received the MH-60G Pave Hawk in 1982. The United States Coast Guard received the HH-60J Jayhawk in 1992. It utilizes the equipment of the HH-60G Pave Hawk on the navalized SH-60 platform. The S-70A Firehawk is a version of the S-70 designed for firefighting, rescue, medical evacuation, and external lift of bulky cargo and equipment. The Oregon National Guard was the first military organization in the world to add the Firehawk to its inventory; the Los Angeles County Fire Department was the first municipal organization. The Army also flies medical evacuation models which are configured as rotary winged medical suites. It also uses the S-70 for special operations by the 160th Special Operations Aviation Regiment (“Night Stalkers”) at Fort Campbell, Kentucky, designated as the MH-60K. The Maple Hawk was a variant offered by Sikorsky to the Canadian Forces during[when?] the tender to replace the military’s search and rescue helicopters. The unit cost varies with the version. For example, the unit cost of the Army’s UH-60L Black Hawk was $5.9 million while the unit cost of the Air Force MH-60G Pave Hawk was $10.2 million. AH-60 Arpia III – Based on the UH-60H platform, is an indigenous development made by the Colombian Air Force, Israel Aircraft Industries (IAI) (Elbit Systems), and Sikorsky Aircraft. Main armament is Hellfire anti-tank missiles and a GAU-21 machine gun on an indigenously developed turret. AH-60 Arpia IV – Based on the UH-60L, is an indigenous development made by the Colombian Air Force, IAI (Elbit Systems), and Sikorsky. Main armament is the Spike NLOS and a Nexter THL-20 gun turret. UH-60 Black Hawk: The basic military utility helicopter for the US Army, with MH-60A, K, L, and M Special Operations variants. SH-60 Seahawk: Variant for anti-submarine warfare, search and rescue, maritime patrol, all-weather and day/night for the US Navy. HH-60 Pave Hawk: Heli-rescue variant for search and rescue, MEDEVAC, and combat search and rescue use on day and night operations for the USAF. Sikorsky MH-60G Pave Hawk, Special Operations search-and-rescue helicopter variant for the U.S. Air Force. HH-60 Jayhawk: Variant for maritime patrol, interdiction, and search and rescue for the United States Coast Guard. The MH-60T Jayhawk is an upgraded version. The company name for the H-60/S-70 family is the S-70 Black Hawk. S-70A Black Hawk (UH-60 Black Hawk): Military model for the export market. S-70A Firehawk Firefighting variant of the UH-60L. Tank system designed and built by Aero Union in Chico, California. S-70A (N) Naval Hawk Maritime variant that blends the S-70A Black Hawk and S-70B Seahawk designs. S-70B/C Seahawk: Maritime military model for the export market. S-70i Black Hawk: International military version assembled by Sikorsky subsidiary, PZL Mielec in Poland. Sikorsky S-71 – a proposed attack helicopter using dynamic components from the S-70. Sikorsky S-92 – Civilian medium-lift derivative of the Black Hawk. H-92 Superhawk – Military version of the S-92. The Sikorsky CH-148 Cyclone is the H-92 version for the Canadian Forces. Turkish Aerospace Industries T-70: A Turkish variant of the S-70i, built under license by Turkish Aerospace Industries with indigenous Turkish mission-computer and avionics (by Aselsan); flight controls, landing gear and transmission (by Alp Aviation); and T700-TEI-701D engines under license from General Electric (by Tusaş Engine Industries) . Turkey was to initially produce about 109 T-70s under license. US Ambassador to Turkey Frank Ricciardone stated that Turkey now intends to produce some 600 T-70s.